Four years ago, in mid-October, I registered my new blog on Blogger. It was to be a diary of sorts for me to write about my experiences in Saudi Arabia, where I was to go in a few weeks' time. My blog started off with a bang. There were many friends and well-wishers who laughed and cried with me as I stumbled, hesitated, sailed through and did every imaginable thing I could as I gradually settled in my new job. Saudi Arabia and its experiences got faithfully recorded by me every single day during those magical first few months. My website showed serious traffic and several of my well-wishers stopped by not to just read my posts, but also to comment in the boxes below each post. To them goes out my unconditional gratitude. As the days turned into weeks, and the weeks into months, my entries became fewer in frequency. A year down the line, I had stagnated. There was hardly anything new to report or discuss as life in a small village in the heart of Saudi Arabia can be completely uninteresting and mundane. My torrent turned into a thin stream, and then, as the years passed, into a small little effort to keep up my blog. I had almost dried up in blogging. 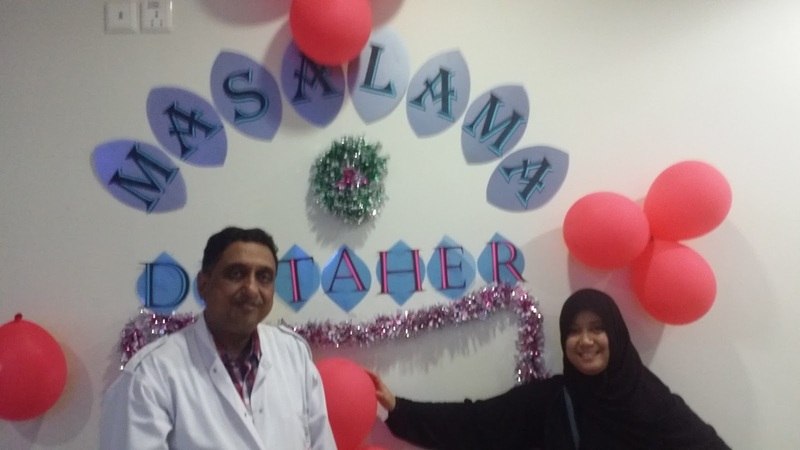 Now, when my return to India is a certainty, I have resumed a bit of blogging there, and am directing my readers to this blog so that they and I remain in touch when the Dr. Taher of Arabia blog has been completely retired and put to rest. What happens after I return to India? A lot of my readers are curious to know what my future plans are. 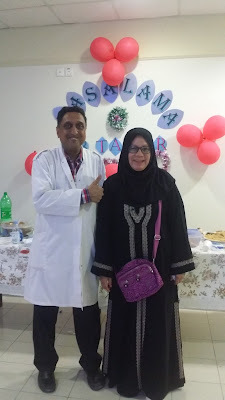 To those who are coming to my blog for the first time, or after a long time, let me inform them that I am a Pediatrician who has been working in a rural area of the Makkah region of the Kingdom of Saudi Arabia. I began working there since mid-November 2011, and am due to leave in a week's time. My other blog has details about my entire 4 years' stay in the Kingdom. Coming back to the topic: these nearly four years have had their ups and downs. I am financially more secure than ever. However, the grass is still green and my gray cells are still functioning. It would be a shame to leave work altogether. Hence, I am exploring options of working in some other country, but I haven't secured a job anywhere yet. The options are UAE, Great Britain, Malaysia, etc. However, I am preparing myself to face the worst situation: that situation is that I do not get any overseas job and I am faced with real unemployment and zero income. In such a circumstance, I will be okay with resuming my practice in Mumbai, or take up a full-timer's job elsewhere in the state in a large hospital. My family members are all working. Hannah is planning to do MBA, perhaps in the US or in the UK, but she also works in a e-marketing business called Go Gappa. Inas is pursuing her career as a senior hair-stylist with Juice Salon, and she is growing her practice all along. Nishrin is happy with her parlour in Bhendi Bazar ( a famous locality of Mumbai, check out this website). In the meantime, I have begun to post ads on this site that link to good medical supply sites. Mostly, these sites cater to consumers in the US. If you are based in the US, do try out their services and let me know how you find them. The banners and ads related to the Medical Supplies Depot and Dr. Fuhrman While MSD supplies all kinds of medications, health-appliances and other services, Dr Fuhrman's main business is to customize weight loss solutions for people. Thank you for clicking on these ads. The last week has been eventful in a few ways. The first thing that I wish to share with you is that the Taif region continues to be short of doctors. As a result, I have been unable to get anyone to relieve me in the past nearly 3 months! In short, I have been on continuous duty for over 90 days, with just one days' break last month, when the muderiya sent a doctor to relieve me. But that was just the exception. Then about 10 days ago, my hospital asst. director Mr. Diyaab allowed me to skip afternoons and go straight home at lunch. This was a very good gesture. It showed that they did care and that their consciences did hurt that they were unable to get me any relief despite several letters sent by them to the Muderiya asking them to send someone to relieve me. This action was later confirmed by the director Mr. Ahmed Farah Sumeri. I have therefore been going for only the morning OPD. I return to my home at lunch and abstain from the afternoon OPD. Patients are told to show the child to the ER doctors and to see me the next morning. The second news is a bit sensitive, and I am not likely to openly discuss it in this blog. However, there was a minor issue involving me, and the Muderiya, in response to someone's protestations, had decided to stop my exit! The issue has now been resolved, and I am likely to complete my exit formalities in the week ahead. The third news is that some of the nurses got together (after my gentle reminder) to arrange for a farewell party in my honour. This party was arranged by Sisters Sajeda Touqeer, Maui Rogelio and Virginita Camaro. It was held in our diet department's restaurant on the afternoon of Monday, 23rd August, 2015. 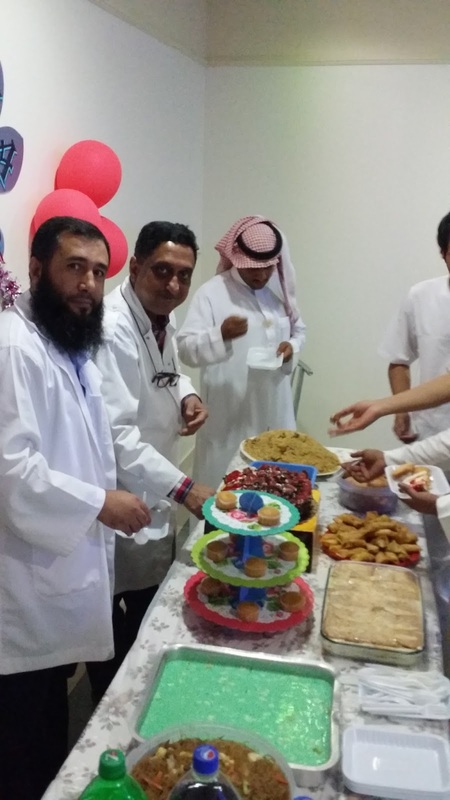 The nurses had really excelled themselves in preparing a glorious spread of food. While Sajeda had brought a delicious, under-spiced chicken pulao, the Filipina duo had prepared Pancit (rice noodles), Donuts (fried), Chicken fry (pieces), Chicken spring rolls, refrigerated cake (delicious) and mawa cake. In addition, they also brought a fresh chocolate cake with fresh strawberry from Queen's Taste in Taif. I cut the cake to start the party, after which we took some photos and then had the food with cold drinks etc. The final bit of news is that within half a day of my writing this, my colleague, Dr. Mohamed Afzal Khan, is expected to start his return journey to the Kingdom, and will reach by nightfall. He should, if he agrees, be able to resume from Thursday, and thereafter, carry on. Thus, today might be my last day of working in Al Moweh/Al Muwayh General Hospital. In the coming week, I will complete whatever work is remaining here, and Inshallah arrive back in Mumbai by the end of it. Only a couple of times before in my life have I seen the way the BSE Sensex and the Nifty crash today! The last few times were on Fridays, but today, bloodshed occurred on the first day of a new trading week, i.e. on a Monday. The Economic times stated five reasons (for some reasons best known to it, most events on the stock exchange are analysed with this omnipresent heading of "Five Reasons") for this crash. The chief ones among these were the falling oil prices, the Greek Crisis, and the mother of them all, the contracting Chinese economy. In addition, it also gave a passing reference to exiting FIIs and some other, relatively unimportant stuff. Be that as it may, it now turns out that investors have all lost big amounts of money in the market for now. So, what should one do? Panic and exit the market, or use this as an opportunity to buy in more of good stocks? Really, it takes a lot of courage to do contrarian buying, but, as the gurus say, you should buy when others are selling and vice versa. So, let us see what happens tomorrow. Some people strongly believe in the phrase "Que, sera, sera" and leave it to the Supreme Being or destiny to chart their lives for them. In this life, many merely swim with the tide, and only a few have the courage to swim against the current and define a new life for themselves. You might say I was courageous when I closed my 25 years of practice in India and moved to Saudi Arabia to begin a new earnings and life chapter in November 2011. Or, you could say that I was a coward who, being unable to move with the times, decided to leave it all and emigrate to somewhere else (an escape from reality). I leave this judgment to you. However, and this is true, I defined all the tasks I must complete before I left KSA. These included financial, moral, religious and other tasks, the details of which you can find on my other blog HERE, and HERE. 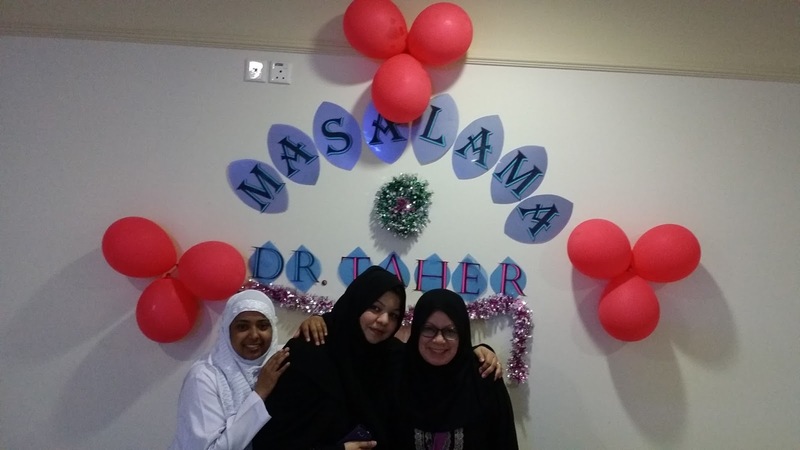 I had initially planned on three years in KSA, but, owing to circumstances outside my control, I have had to do one more year here, but now, I am on the verge of completing this final year as well. I have met all my goals that I set out in the blog posts shared with you above. Now, I am ready to do more with my life. Yes, I am older, but I am still brimming with knowledge, skills and activity, and I am not ready to call it a day as yet. I will disclose my plans in the days to come, but one or two things I can share with you here. First of all, I am planning to continue working overseas. It is probably futile to consider working in Mumbai again, for more than one reason. The main reason is that my clinic premises do not exist any more, as Nishrin converted this into her salon more than a couple of years ago. I have not made enough money here in the Kingdom to look for another shop! Also, I would be starting my practice afresh, and this is not a happy scenario in a big city like Mumbai with over 1500 qualified Paediatricians, 50000 plus General Practitioners and over a lakh quacks, who are all seeing children day in and day out. Besides all this, I am not ready to compete again in the rat race, and I have no stomach for playing the game that doctors in this vast metropolis play to augment their incomes. I am sure astute readers will understand what I am pointing to. Secondly, I have decided to enter some form of enterprise that will give me residual income, viz. business. Ethically, doctors cannot enter into a business as proprietors or owners, so I am considering investing somewhere. I welcome ideas from my readers on where I should put some of my money (it isn't much, mind you, and I am not looking at buying property, land or stocks, so please don't give me those suggestions). This is just a mental idea right now, but I am wondering if running a pharmacy might be considered as a possibility. Or something else. That's it for now. Do return to keep reading this blog. I intend to post again in a few days. Thank you for reading. Even as I write this, I have been trying to complete the several formalities that go with the end of my final contract of work in Saudi Arabia. I am keeping myself occupied with other things too, such as making food every day, entertaining my friends at dinner, writing stuff on the net, reading stuff on Kindle, on Whatsapp, on other social media, and so on, and making some purchases for things to take back with me to India. My process of application to the General Medical Council of the UK is also going on. There have been a few hurdles. To wit, I am supposed to get a Certificate of Good Standing from the Maharashtra Medical Council. This is an online process, but it has met with several issues - the last one being that the network administrator has blocked the user site as it is located in Saudi Arabia. I don't know why the site should be blocked just because it is in KSA. I have begun work on a project to create posters and leaflets for a Cardiologist practising in Bangalore, India. The job came to me through Freelancer. He is to pay me USD 1000 for completing all my work. It is a challenging task to work on cardiology projects, since, being a pediatrician, I have no exposure to cardiac topics. However, it is enjoyable as well. My diabetes is somewhat better. I have lost some weight as well, and have a high random sugar, but not too high (142 a few days ago, half an hour after having a milk-tea sugar at about half past ten in the morning). In other news, I am still waiting for the Muderiya to give me some days' relief now that I have over 50 days of leave pending in my name. However, I am sorry to say that there is no one they have to replace me. I may have to forgo my rights of these days of leave. Today, I submitted my final exit papers with my Iqama to our coordinator at the Muderiya, Mr. Ali Asmari. With this, the final process of my exit has officially begun.I hope things turn out fine, as I expect there to be some problems in any new work. That's it for now ... will write again tomorrow, so please visit again. Thank you. 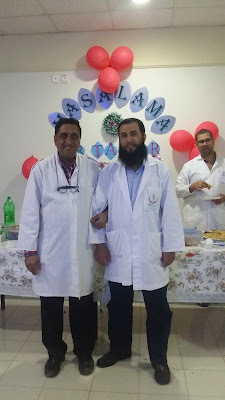 It may seem to my dear readers that I have lost interest in writing this blog as I am arriving at the fag end of my career here in Saudi Arabia. However, that is only partially true. The real reason is that I am doing a lot of other things to keep myself occupied. Currently, I am doing an online course (on www.coursera.org) on "Contemporary India". It is being taught by the faculty of Indian studies in the University of Melbourne. It was a pleasant surprise to hear the lectures given by Australian teachers who knew so much about India, its history, its culture and its people. Two weeks into the course, I am also surprised by the level of interest among non-Indian students - all 4000+ of them from all parts of the world. They have so much knowledge of India! I have met students who desire to visit India, and I have also met some who have been to India more than a dozen times in the last decade. Isn't that astonishing? I am also trying to get writing jobs from www.freelancer.com. I got my first job yesterday, when a Bangalore-based cardiologist hired me to prepare brochures for his practice. This will probably be an easy task to handle, but it will also get me more jobs as my profile will show a satisfied client who got what they wanted. I am also busy looking after my own health. A few days ago, I came down with a severe backache. Today, it became almost unbearable, and I had to take many tablets and an injection of diclofenac (a pain-killer, commonly known as Voveran in India) to be able to work. I went to the medical director and urged him to find a replacement for me for some days so that I can rest. I also went to the physiotherapy department, but the Saudi technician working there was completely ignorant on how to use the different treatment modalities and ended up giving me a hot water bag only! (The Indian female physiotherapist Dr. Sumitra is on leave.) I am hoping that the Muderiya arranges for someone to come and relieve me tomorrow (I am writing this on the night of Monday, 3rd August 2015). I have been following the antics of the Parliamentarians in India on Times Now on my idiot box and find that the way Congress M.P.s have behaved in the last ten days - disrupting the work of the Monsoon session of the Parliament - is really shameful. It was a good thing that the Speaker of the Lok Sabha finally suspended 25 Congress M.P.s from the legislature for five days. Hopefully, this implies that business will be conducted from tomorrow, at least in the lower House. Finally, I will end this entry by thanking my readers. We have 367 posts in the near-four years I have been in Saudi Arabia, and over 40000 views of my blog. I hope and pray that my readers, i.e. you, will continue to follow me and my writing in the months to come, when I will probably change the title of this blog - or start a new one when I start working from a new location. Thank you for being with me till here. Cya, bye.